The Swedish firm of Bofors is famous above all for the seemingly immortal 40mm automatic cannon. However, a variety of other automatic (as well as non-automatic) guns have been produced by this manufacturer and this article is an attempt to do justice to them. The main focus is on weapons of up to 57mm calibre, but others are mentioned. AB Bofors acquired its name in 1873, but this company was the culmination of a long history of steel manufacturing by a small creek called Bofors, near the town of Karlskoga, beginning in the 17th Century. In 1883 the company decided to begin arms manufacturing. There was a considerable expansion of this activity in the First World War (despite Sweden's neutrality) and in the 1920s Bofors co-operated with Krupps of Germany, which was restricted in its own armament developments by the Treaty of Versailles. There is some dispute over the extent of the influence of Krupps on Bofors designs, but during this time Bofors developed a range of large-calibre guns, starting with a 75mm AA gun and including many other non-automatic weapons for army and naval use. These included a 37mm anti-tank gun (which briefly saw British service in North Africa in WW2) but also guns of 88mm, 102mm, 105mm, 120mm, 150mm and (last but far from least) the 254mm (10 inch) naval guns in twin turrets, fitted to the Finnish Ilmarinen class coast defence ships. The largest calibre guns ever made by Bofors were the 280mm M/12, for the WW1-era Sverige class coast defence ships for the Royal Swedish Navy, and the 305 mm M/16 for the Swedish Coast Artillery (8 guns) and also sold to Norway (4 guns) and taken over by the Germans. The involvement of Bofors in automatic weapons began in 1925, when the Swedish Navy requested the development of a 20mm AA gun. However, by 1928 the Navy had revised its requirements and asked for a 40mm gun. The first 40mm gun was for naval use and emerged in 1932, hence the designation M/32; this was for submarines, the first surface-ship version being designated M/36. The first mobile field mounting was the Model 34, and this achieved the majority of the huge export sales between the mid-1930s to the late 1940s. 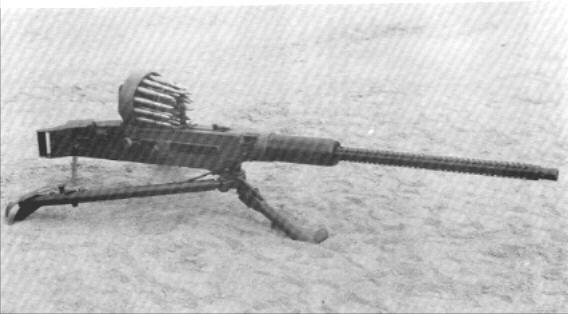 At that point, the classic L/60 gun was replaced by the more powerful L/70, which is still in production today. Despite this, the 20mm was not forgotten and saw service later as the m/40, both as an AA and an AT gun, as well as being fitted to various naval craft. 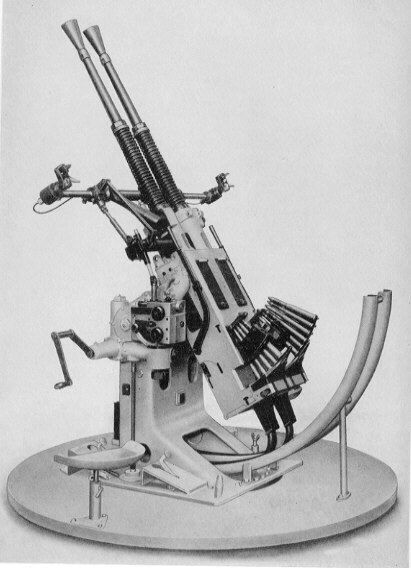 At the end of the Second World War a completely different weapon, the 20mm m/45, was developed as an aircraft gun; a modified version was known as the m/49. 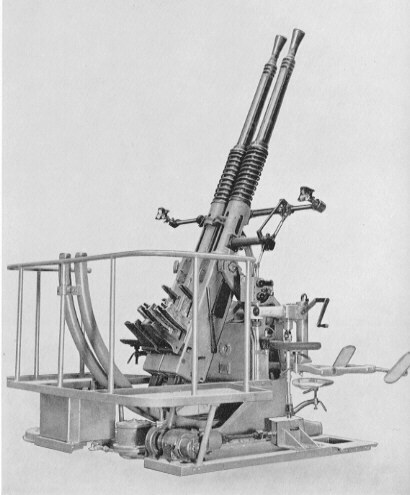 A 25mm AA gun was also produced in parallel with the 40mm and was similarly known as the M/32. (It should be pointed out that a capital 'M' in the designation is used for naval weapons, a small 'm' for others). It was available in land mountings but was used by the navy, initially being fitted in dual mounts to destroyers in preference to the 40mm which was initially considered to be too heavy. The 57mm guns were produced in two versions after the war; a powerful land (m/54) and naval (SAK 57) AA gun (still in production as a naval gun) and a much less powerful aircraft gun, the m/47. In addition, automatic-loading guns in larger calibres were built postwar. 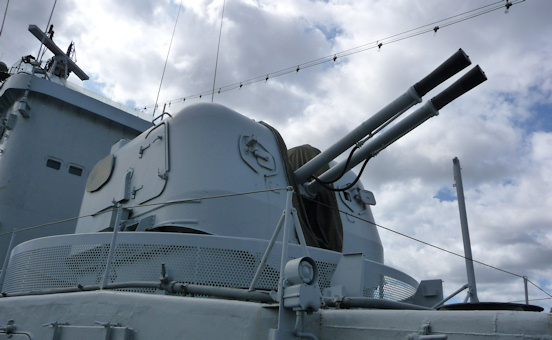 Naval weapons include the 76mm low-angle turreted gun fitted to the Norwegian Storm class patrol boats in the 1960s, which also equipped no fewer than 30 three-gun coastal artillery batteries in Sweden, then designated “7,5 cm KA-pjäs m/57”. It could fire a SAP shell with base bleed. 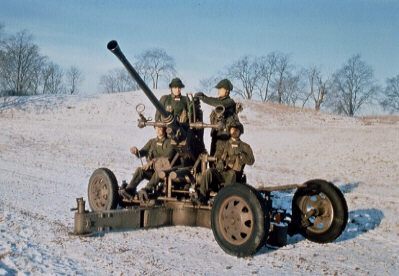 The gun was also used in mobile coastal artillery batteries as the m/65. There was also the twin 120mm mounting fitted to the Halland class Swedish destroyers (among others - it was also used on no fewer than ten Dutch destroyers and two Colombian ones, built in Sweden) in the 1950s, and the impressive 120mm L/46 single-barrel mounting of the late 1960s which was originally developed as a land mounting (the m/61) but only saw naval service, fitted to a few Finnish and Indonesian ships. For the Swedish Army, Bofors produced the 155m Bandkanon self-propelled artillery piece in the 1960s (on the right). This was a highly impressive piece of equipment which could empty its 14-round magazine in fully-automatic fire in 45 seconds. 26 were delivered to the Swedish Army. It was also extremely expensive, so the succeeding FH-77 equipment was more modest, although still capable of a fast three-round burst. 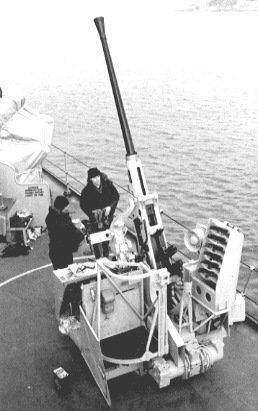 For coast defence, Bofors produced the 120mm L/62 ERSTA, mounted (like most Swedish coast defence guns) in a concealed, self-contained gun turret with its own underground magazine, power supply and living accommodation for the crew.The 12 cm gun for the ERSTA batteries actually entered service in the late 1970s, equipping a total of six batteries in Sweden and some (two?) in Norway. 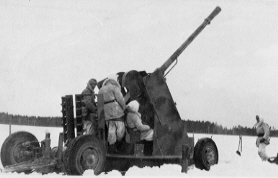 The same gun and the mount for the army’s FH77 howitzer were also mated to form the “12 cm KA-pjäs m/80”, which equipped mobile coastal artillery batteries. The gun could fire a base-bleed shell out to 25 km. The 20mm m/40 followed the same pattern of long-recoil automatic mechanism as the 25mm and 40mm guns. It was chambered for a unique and quite powerful 20 x 145R cartridge, and could fire at 360 rpm. 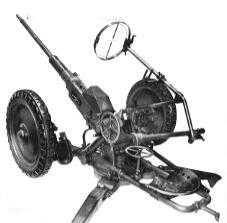 On a wheeled AA mounting (below left), it weighed 300 kg; on a low tripod for anti-tank use as shown bottom left the weight was 65 kg (the same gun was used in both installations, and could be switched between mountings). In anti-tank form it was reportedly known as the "grasshopper", as it jumped about so much on firing! It was known as the PansarVärnsLuftVärnskanon m/40 (PVLV) which translates as "Anti-tank/anti-aircraft gun". 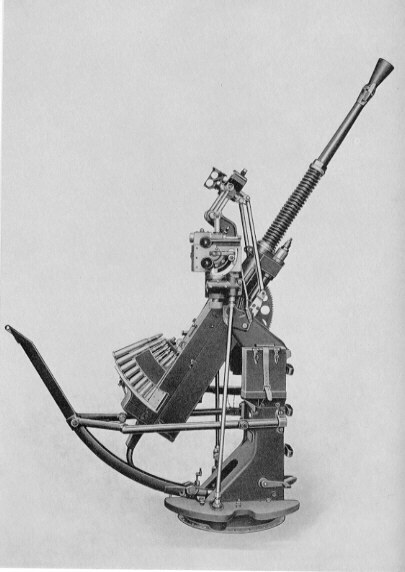 The ammunition feed mechanism consisted of an exposed 25-round rotary magazine above the gun, which in the AT mounting meant that the sights had to be fixed to the side. It appears that these weapons were only used by the Swedish army, with some 2,700 guns being produced. It was also fitted to about forty PB m/31 armoured cars and to fixed AA and "combination" mountings. The 20mm m/45 and m/49 were quite different, being short-recoil guns chambered for the 20x110 HS 404 cartridge, which was ordered in the 1930s but not accepted for service until after WW2. Their development was prompted by concern about the difficulties in importing weapons in wartime so it was decided to make an indigenous design to meet the needs of the rapidly-growing Swedish Airforce. Size, weight and rate of fire were all quite similar to the Hispano HS 404, and in fact the French gun was also in service with the Swedish air force during the 1940s. The Bofors guns saw service in some of the early Swedish jet strike/ground-attack aircraft; the SAAB A21 and A32A respectively. 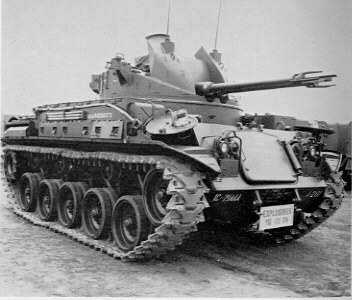 They may also have armed the Pbv 301 and Pbv 302 IFVs from the late 1950s. The m/49 guns are shown below right. The 25mm M/32 was designed around a 25x205R cartridge, the feed mechanism being via 6-round clips held in vertical frames above the breech which were capable of taking two clips so that continuous fire could be maintained without the need to pause to change magazines. The clips were in two halves, which split and fell away as the cartridges entered the frames. The gun, which looked very similar to its big brother, had an L/64 barrel and fired at 160-180 rpm. It was available in four-wheeled mobile (above left) or fixed single mountings, or a fixed twin mounting (above centre), although the mobile mounting apparently did not enter production. Weights varied from 570 kg for the fixed single mountings (which included one designed for submarines which retracted into the hull - shown above right) to 1,100 kg for both the mobile single and fixed twin mountings. A revised version, the M/38, fired 25x187R ammunition, but neither saw much service. The development of the 40mm guns divides neatly into two, distinguished by their different ammunition. The L/60 (also known as L/56) fired a 40x311R cartridge, the L/70 used a significantly larger and more powerful 40x365R round. There was also an L/43 submarine gun fitted in a retractable mounting. Some of the weapons fitted to ships were virtually identical (they were just the army guns on a naval mounting), but the proper naval versions had water-cooled barrels to enable sustained fire, and they were fitted in multi-gun mountings. Bofors only produced twin mountings as shown below left (interestingly, with stabilisation fitted), but the USN developed a four-barrel version and the RN fitted its last battleship, HMS Vanguard, with six-barrel mountings. Weight of the mountings varied hugely, as you might expect. The army gun weighed 2,000 kg, the stabilised twin mounting 3,500 kg. 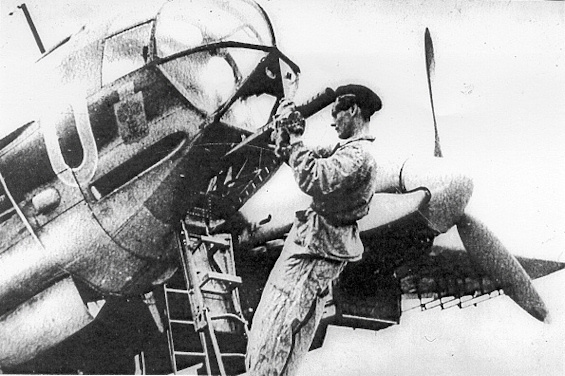 Ammunition fired in the L/60 was primarily HE-T (available in a huge variety of loadings from various countries), with a nose contact fuze and self-destruction via tracer burnout, usually in eight to eleven seconds. An SAP loading was available as was a little-used AP shot, generally for the self-defence of frontline army AA units which might find themselves unexpectedly confronted by enemy AFVs. The 40mm L/60 was one of the most successful weapons of the Second World War, seeing service in huge numbers in both army and naval versions with many nations. The US alone manufactured about 39,000 during WW2. It was even fitted to a few Hungarian Messerschmitt Me 210 heavy fighters. Despite being supplanted in production by the L/70, the L/60 has continued in service ever since. The RN continued to use it into the 1990s (they never adopted the L/70) and it is still fitted to USAF AC-130 gunships. Bofors offers an updating service to enable these venerable weapons to benefit from the latest technology in ammunition and fire control systems. 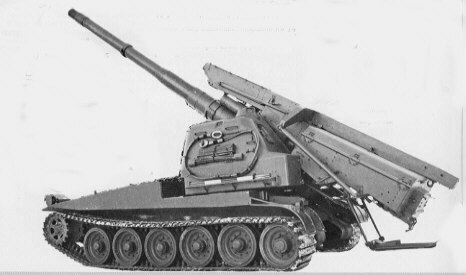 After the war Bofors sought to build on the success of the 40mm and developed a new and more powerful version, the L/70, which first emerged in 1947 and entered service in 1951. As well as a much higher muzzle velocity, this had modifications to the mechanism to increase the rate of fire; first to 240 rpm, then 300 rpm, and in the latest Trinity version to 330 rpm, thereby maintaining the effectiveness of the AA gun into the jet age. Breda, who make the Bofors gun under licence, have made further modifications to raise the RoF to 450 rpm in their naval Fast Forty mounting. The modern mountings (both land and naval, as before) are all fitted with a single air-cooled barrel, are power-driven, and feature extended clip frames holding up to 43 rounds to allow a larger ammunition supply for immediate use. The most sophisticated naval versions have a 101-round power-operated magazine. Two of the 40mm guns are shown in enclosed mountings on board the destroyer Småland, shown below left (the big twin turret is the aft 120mm mounting). Weight of a typical four-wheeled land mounting (including on-board generator) is 4,800 kg (see photo below right). The L/70 guns have found their way into a variety of vehicles, from wheeled and tracked SPAAGs to MICVs. One of the most ambitious efforts was the abortive US Sgt York DIVADS (DIVisional Air Defence) project which featured two guns in a radar-directed turret, all on a tank chassis. Of even more significance to the lethality of the weapon have been improvements in fire control and ammunition. Although predictor sights were developed in WW2, much shooting was done using the simple 'spider web' open sights. Much more sophisticated systems have steadily been developed, culminating in computerised fire control systems utilising radar target location and aiming. By the 1970s, proximity fuzes were made small enough to fit the 40mm shell (it is still the smallest proximity-fuzed shell in service) and the latest versions have a '3P' round which combines a pre-fragmented HE shell (PFHE) with a programmable fuze. As well as the normal proximity function, the fuze can operate in five other modes: gated proximity (fuze only activated close to the target to avoid premature detonation); gated proximity with impact priority (a slight delay in activation to provide the opportunity for a direct hit); time function (for airburst fire to provide a Shrapnel effect against surface targets); and two impact functions with variable delay. A normal engagement will consist of a burst of fire with the aim automatically shifting between shots to bracket the target. Other types of ammunition available include Multipurpose, a Raufoss development available in many other calibres which is an HEI round with no fuze - chemicals in the nose are detonated by impact - and for land use in AFVs an APFSDS round capable of penetrating about 150mm of armour. The Bofors AA gun continues to flourish despite ever-growing competition both from smaller weapons (most recently the 35mm Oerlikon AHEAD system) and from steady improvements in short-range quick-reaction missiles. 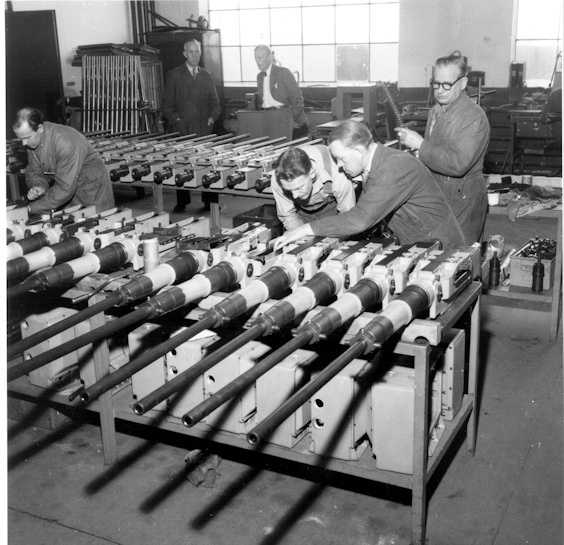 Although work on scaling up the long-recoil automatic mechanism to 57mm calibre started during the Second World War, it did not result in a production weapon until afterwards. The first to emerge was an oddity; the m/47 aircraft gun (below, left and right). The gun and ammunition were solely designed for aircraft use, and only fitted to one model - the SAAB T 18B. This was a version of a wartime twin (piston) engined attack/torpedo bomber, and it appears that the m/47 was intended for anti-shipping purposes. It was mounted in the lower nose of the plane, with the rotary 41-round magazine fitted into the bomb bay. The gun weighed 290 kg, was 3.84m long and fired at 100 rpm. The 57x230R cartridge was available in both HE and AP loadings. 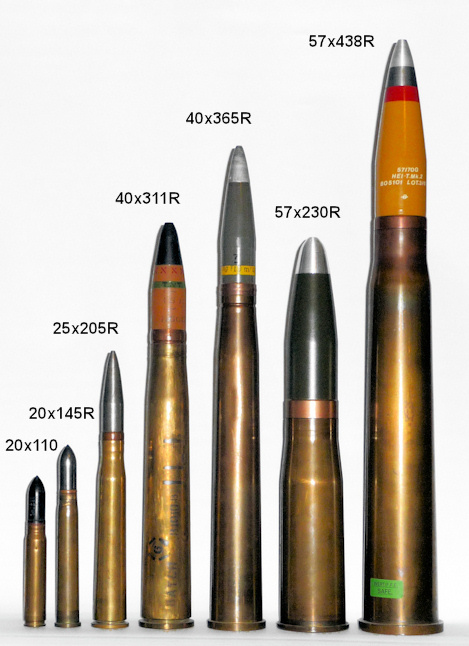 The true scaled-up 40mm was the army and naval AA L/60 gun, designed around a far more powerful 57x438R cartridge. 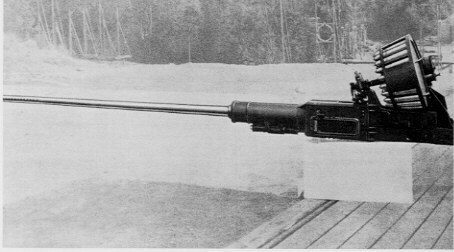 The army gun was the m/54, and this saw service with Sweden and Belgium. Cyclic rate was 120 rpm, and the traditional four-wheeled mounting weighed 8,100 kg (shown right). Effective range is quoted as 4,000m. The m/54 soon became history, replaced by AA missiles, but the 57mm naval gun has had a much longer run and is still in production today. Initial versions had water-cooled barrels, and were available in single or twin mountings (the twin mounting below right is the B mounting in the destroyer Småland). Rate of fire was 120 rpm. The French Navy developed their own twin mounting around the gun, and fitted several of them to larger warships as close-in AA defence. 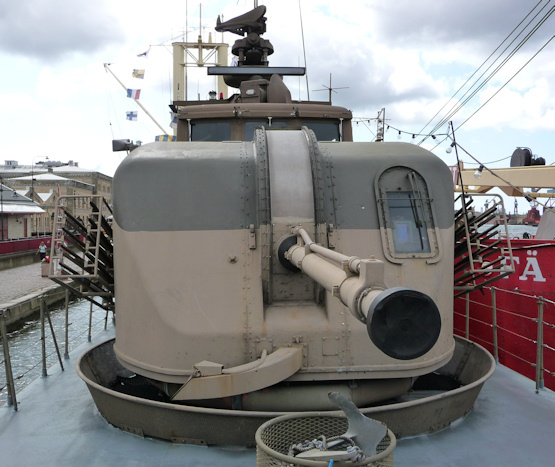 The single-barrel mounting lasted longer as the principal armament of large patrol boats and corvettes (as shown below left, in the Hugin. The gun was improved to the L/70, although in this case the ammunition remained the same. Still further improvements produced the current SAK 57, with an air-cooled barrel (made from improved, more heat-resistant alloy) and the RoF increased to 220 rpm. This is now available in a 'stealth' mounting, with a gun barrel which disappears into the mounting when not required. 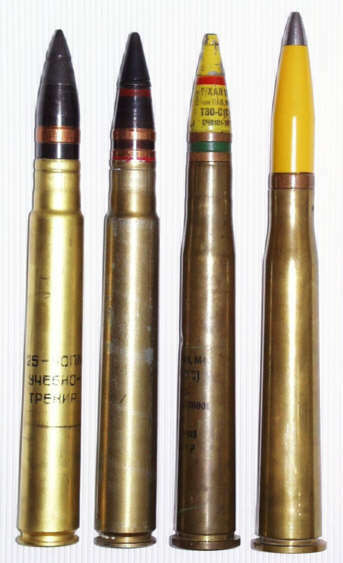 The 57mm ammunition has benefited from the same improvements as the 40mm, and there is a 3P version with similar fuze options. 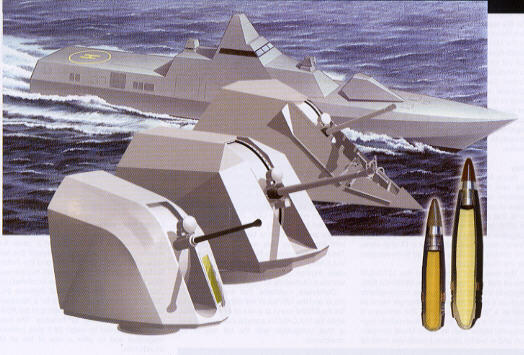 There is also an HCER (high capacity extended range) shell capable of reaching out to 17 km. The SAK 57 is probably now more successful than it has ever been. It offers a useful range of capabilities, particularly anti-aircraft, anti-missile, and anti-FPB. It may be less useful against larger ships or in firing against shore targets, but even so the experience of HE shells dropping all around you at nearly four rounds per second cannot be comfortable. Second-line warships and coastguard vessels arguably need nothing else, except for a pair of manually-aimed HMGs or light cannon for police work. In the early 2000s Bofors was acquired by the US firm United Defense (which has in turn been bought by BAE Systems), which has provided more opportunities for sales. This has resulted in the selection of the SAK 57 as the MK110 to arm three new US warship projects: Coast Guard cutters, the DDG-1000 Zumwalt class, and the Littoral Combat Ship. In conclusion, Bofors has a unique history of continuous development of a highly successful system. The company can hardly have imagined when they started work in the 1920s that direct descendents of their guns would still be winning sales three-quarters of a century later. In this "family photo", the 20x110 Hispano ammunition shown here is in a Swedish-production armour piercing loading. The same projectile is also shown in the 20x145R round next to it. High-explosive loadings used longer projectiles. The other cartridges are all shown with HE-pattern projectiles. The 57x230R shown here has a replica projectile, made from factory scale drawings. This section is based on information in Chris Koll's excellent book, 'Soviet Cannon'. 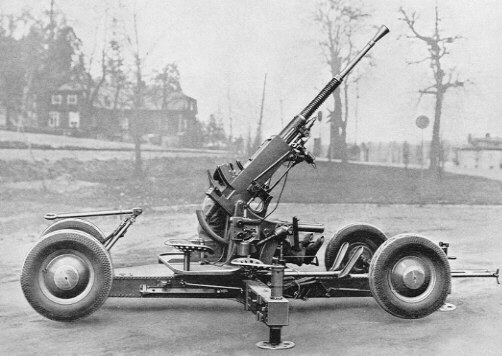 Several late-1930s AA gun developments in the Soviet Union were based on the Bofors long-recoil designs, although none was a direct copy. After World War 2 production of the 25mm M1940 and 84-KM ceased but it was decided to make an improved version for the Soviet Navy. 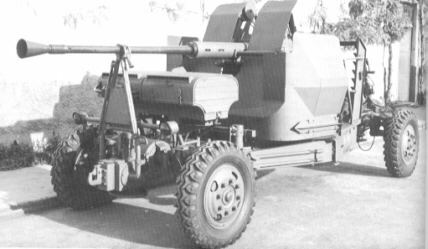 This was the 110-PM by Nudelman, which departed from the Bofors-type long-recoil mechanism of the earlier guns in being a short-recoil design (basically a scaled-up version of the 23mm NS-23 aircraft gun) chambered for modified, rimless 25x218 ammunition. This gun appeared in the unusual twin-barrel 2M-3 mounting, with the guns stacked one above the other. The rate of fire was initially only 270-300 rpm per barrel, but in the late 1950s this was greatly improved in the modified 2M-3M to 470-480 rpm. This weapon was adopted by the Chinese Navy and remains in service in some second-rank navies, principally in smaller craft such as fast patrol boats. The photo on the right shows two examples of the 2M-3 25x218 rimless round on the left, then the 25x218R for the M1940 and, on the far right, the Bofors 25x205R for the m/32.